This TableView control for FireMonkey is 100% full source code compatible. It is also highly configurable and styleable cross platform native applications development for Windows, Mac OSX and iOS. The component showcases its capabilities and performance through eliminating the complexity of application development by providing easy-to-use, programmable components that facilitates developers to rapidly build fully engaging customizable list items, offer built-in support for searching and filtering. It also provides built-in support for editing items and / or delete items. The TableView control offers smooth scrolling with inertia, direct navigation, single and multi select while the TableView is capable of displaying data in list mode and in group mode like in iOS apps. It also has an optional detailView per item. Any FireMonkey component that descends from TControl can easily be used to show the item detail and the built-in support for use with LiveBindings which provide a way to connect user interface controls and datasets. No need to write long expressions or do all your work in code, look at the big picture and make your connections with drag and drop simplicity that exists within this framework, allowing you, the developer to easily bind any item element to data and manage them too. Automatic generation of categories based on alphabetic, alphanumeric or custom category support brings in the power of unmatched buffered display for improved performance. When you get this component it also comes with a few other components. You can rapidly embed and manage your images on IOS with this Delphi XE5 FireMonkey control using the TTMSFMXBitmap component (also compatible with TTMSFMXBitmapContainer). It that includes an extensive and flexible component suite that offers resource friendly reuse of images enabling Delphi developers to add powerful multimedia functionality to their applications seamlessly and at the same time giving the images the professional look and feel. The TTMSFMXHTMLText is also included as a separate component to show HTML formatted text. 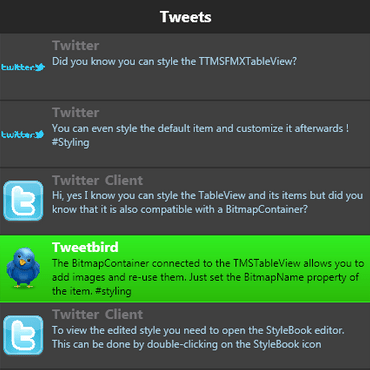 Also the FireMonkey Control comes with a TTMSFMXPopup component that offers display controls in a styleable popup form. It also contains TTMSFMXSearchEdit control that is embedded with search / clear button for fast searches and clears. It’s TTMSFMXBarButton control is a user interface control that can have an arrow shape and is readily available to Delphi developers to incorporate into apps. This FireMonkey TableView control for Delphi XE5 is also packaged with full 3 demos, illustrating the power behind the capabilities for cross platform development, meanwhile overview demos for iOS is available only in the registered version. The FireMonkey control comes with an extensive detailed PDF developers guide to offer instant help for developers who want to quickly get their applications up and running. Check out the full feature set of the TableView component.